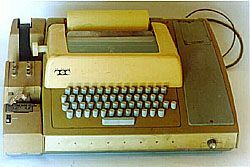 Ok, so this isn't really a computer but it was my first exposure to computers. I used these to connect with the school's computer with a 110 baud modem and saved my programs on paper tape. I still have those tapes and I'd really like to pick up one of these for old time sake so if you have one taking up space, send it to me.